Nike's revenues grew worldwide, with one big exception: China. Nike continued to step it up this quarter. The world's largest sports apparel company reported earnings of $0.86 per share, which beat analyst expectations, and revenue growth of 8% - to $7 billion - which was on par with projections. Nike (NKE)'s future orders, a strong barometer of the company's prospects in the months ahead, were up 8%. Its stock surged 6% in after-hours trading after climbing just over 2% during the day. Much of that jump came in the final two hours of trading. Nike also reported revenue growth in every region except for in China, where it dropped 3%. But the company now expects revenue to grow there next quarter, after initially projecting a second quarter of losses. Analysts are closely watching Nike's success in China, which has not performed as strongly as North America. Brand president Trevor Edwards told investors the company was taking "decisive action to reset this market." He said sales were up at stores where product selection and layout had been changed. Last quarter, CEO Mark Parker cautioned, "The race in China is a marathon, not a sprint, and we're set up for the long run." Edwards said the company's success in Western Europe, where sales were up 8%, showed Nike's efforts to revitalize a market could be successful. Next year, the company is looking to the World Cup -- the soccer championship to be held in June in Brazil -- to boost its sales. "We intend to build upon our position as the leading football (soccer) brand in the world," Edwards said, pointing to the Hypervenom cleat worn and marketed by a Brazillian soccer star, Neymar, that has become the company's second-best selling cleat. Although Nike's stock has performed strongly this year, competitor Under Armour (UA) has outpaced it. German-based competitor Adidas (ADDDF) last week lowered its full-year guidance citing Euro currency issues. 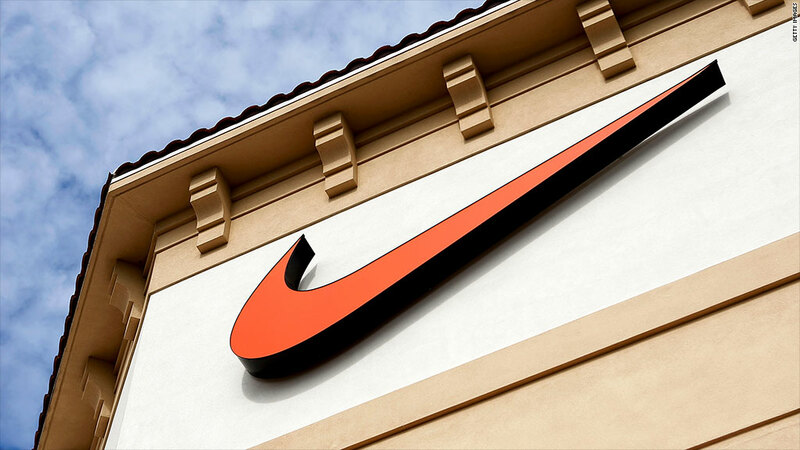 Earlier this month, Nike joined the Dow alongside Goldman Sachs (GS) and Visa (V), becoming the sole apparel-maker on the index. Those three filled spots vacated by Alcoa (AA), Hewlett-Packard (HP) and Bank of America (BAC), which were removed from the benchmark index because of their low stock price.